These Fate calves are purely impressive. Ester is a well-balanced cow with correct bone, leg, feet and udder structure. Ester and her offspring are easy to handle and a joy to be around. Her dam is sired by Summitcrest Complete 1P55. He recently had progeny sell for over 100k and we can see why when we look at Ester! This picture was taken July 2018. 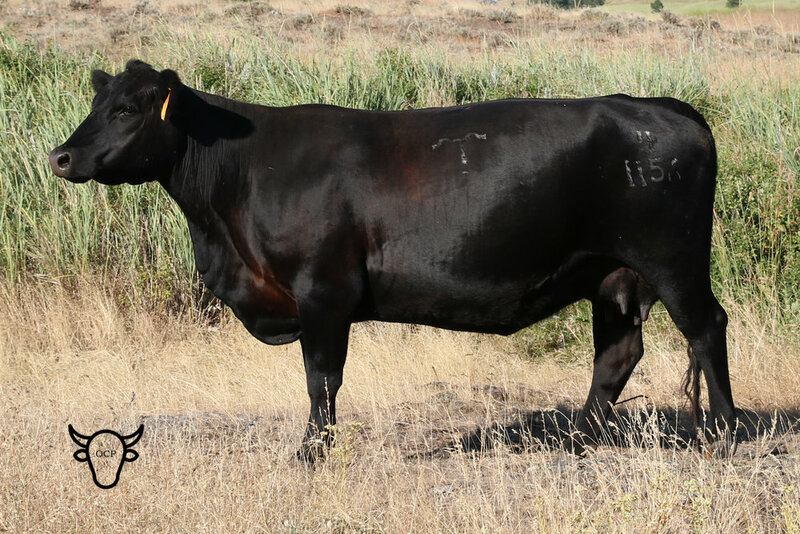 She holds her body condition well while raising her own calves. Treasure Bull Test 85, GB Ten Fate B5. This picture was taken in September after weaning. He is a thick-sided bull calf, like his flush mate brother. Coupled with his great looks is correct structure and a stunning set of EPDs, he will be a super herd sire. Easter showing off her great profile. Flush sister to TBT 85. TBT 85 Flush brother and his awesome calving ease head. He is being retained as a herd sire for G&B Ranch. TBT 85 showing off his great set of shoulders in September. Another great Fate x Ester mating heading to test! Flush sister to TBT 85 shown at at four months. What a great feminine look! TBT 85 in early June 2018. These are meaty calves!